Yesterday I brought you my first Online Poker India Review, telling you everything you need to know about the online poker site 9 Stacks. Now, we are moving on to the next installment. The next online poker platform I would like to talk about is Real Poker India. Now I am sure that those of you who already play online poker in India are getting familiar with Real Poker India, as they have been making great strides in the online poker scene. 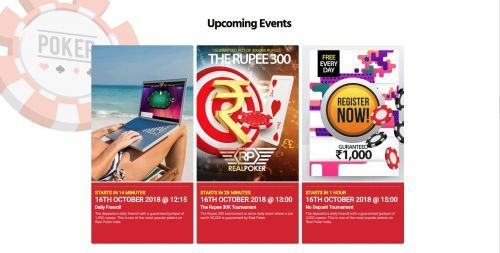 However, Real Poker India is relatively new as it has only been around for a few months, so I will hopefully be able to give you some insight into what to expect from these guys. First off, Real Poker India is very easy to sign up for and the sign in process is the smoothest around. 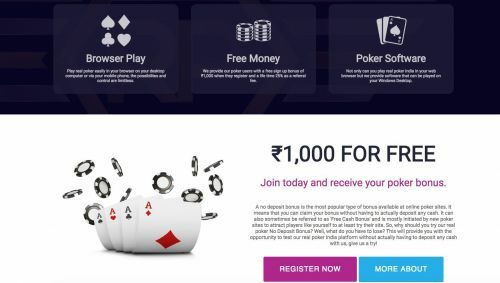 Additionally, upon signing up with Real Poker India, you are given a free No Deposit Bonus of ₹1,000, so you can start playing on their platform right away. The site as a whole feels very slick and very easy to navigate through. Whether you are using your PC or your mobile, it all just feels so natural. When it comes to actually making a deposit, Real Poker India has bonus codes which you can use so that you can double your initial deposit. The site also has a level system, which you work your way through, collecting some exciting prizes along the way. Things don't end there either. 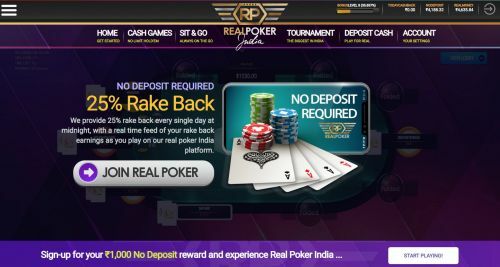 Real Poker India also gives a 25% Referral Fees to their users who bring in other players to the site. The site also gives 25% Rakeback, which is updated in real-time and is paid out every midnight. If that is not enough to entice people to go and play on the Real Poker India platform, then there is the actual gameplay. You can choose from a number of different table colours as well as a huge amount of different backgrounds, with some of them moving as you play. The speed of play is up there with the smoothest around, not leaving you hanging around and waiting for your turn. The action buttons are smooth too and I would argue that the gameplay rivals any of the big boys in the poker business. As I mentioned, Real Poker India is still relatively new to the online poker scene but it is already proving that they have what it takes to be one of the big players in India. The future definitely looks bright for Real Poker India and there has been talk of them making some upgrades and additions to their platform in the near future, which I am very excited about. Rating: 5/5 - If you have not yet tried out Real Poker India, then I suggest you do so, as they are among the best online poker platforms I have come across.